My favorite question. What do you want to eat? 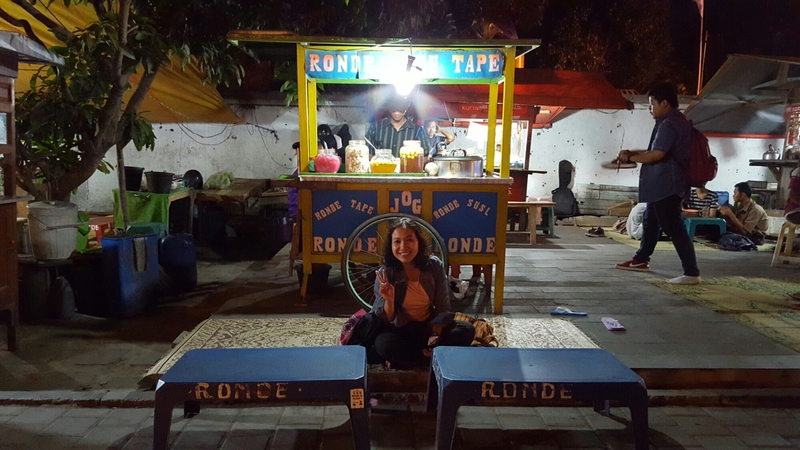 Food has been the best conversation starter and an unwavering opportunity for me to connect with people here in Indonesia – from introductory dinners to teachers snacking during school to meeting locals at food stands. 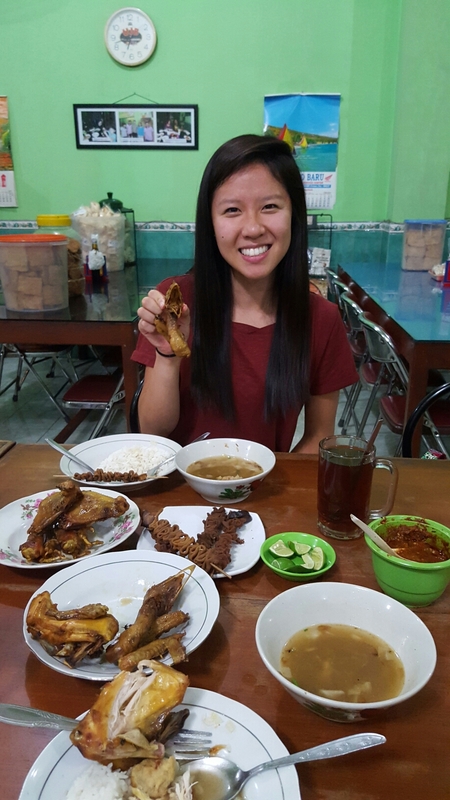 The sharing of food and the good feels that come with a hearty meal have been a huge part of my experience so far. 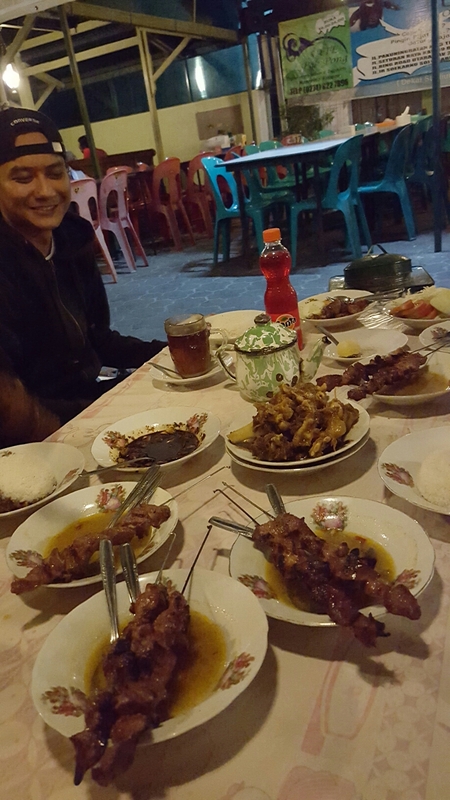 Thus, I dedicate this post to Indonesian cuisine. Here are some of the dishes I’ve had so far. 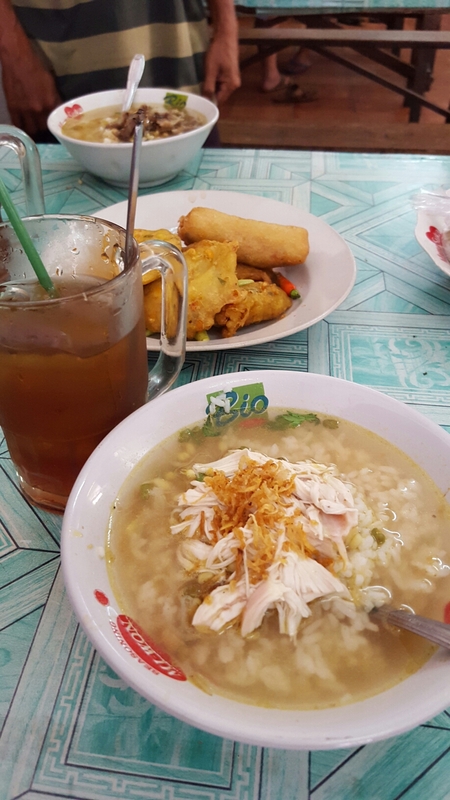 Soto ayam is pure comfort food. It’s a warm herbal chicken soup with soaked rice and soft shreds of chicken on top. 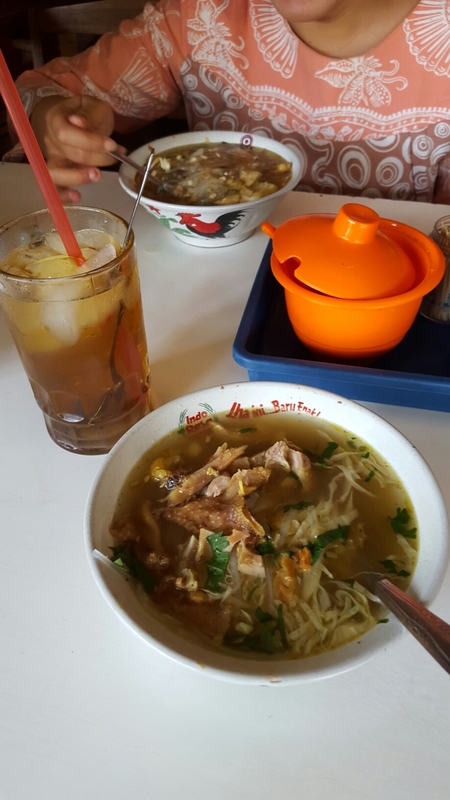 Soto is different from warung to warung, and it’s always cool to see how different places tweak the recipe to make their own version. I could eat soto all day long, but it’s typically a breakfast/brunch kind of thing, which makes a lot of sense to me because it’s like a big warm hug for your throat first thing in the morning. Does this bowl of noodles cry out to you as much as it does to me? 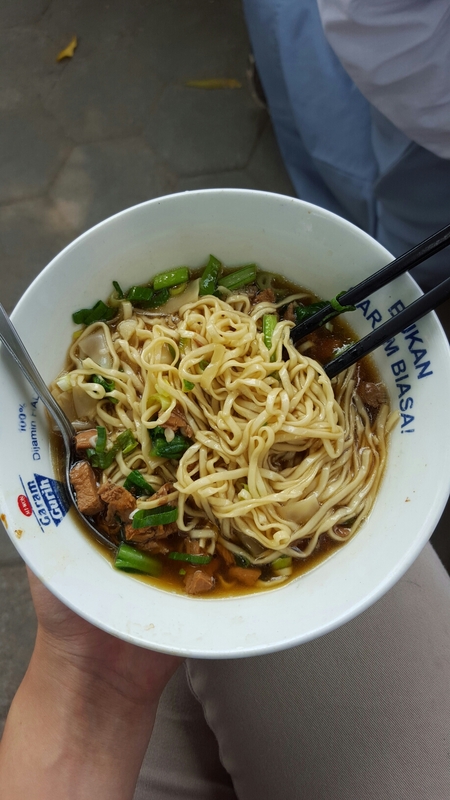 Mie ayam is one of my top 3 favorites, and it’s sold right outside my school. The noodles are soft and slippery and the broth is nice and onion-y. You can get wontons and mushrooms in your bowl too. I get mie ayam so frequently that the Pak just laughs when he sees my face and turns around to start stirring up a bowl for me. During my first week here I got it twice in one day and he made fun of me for it for days. 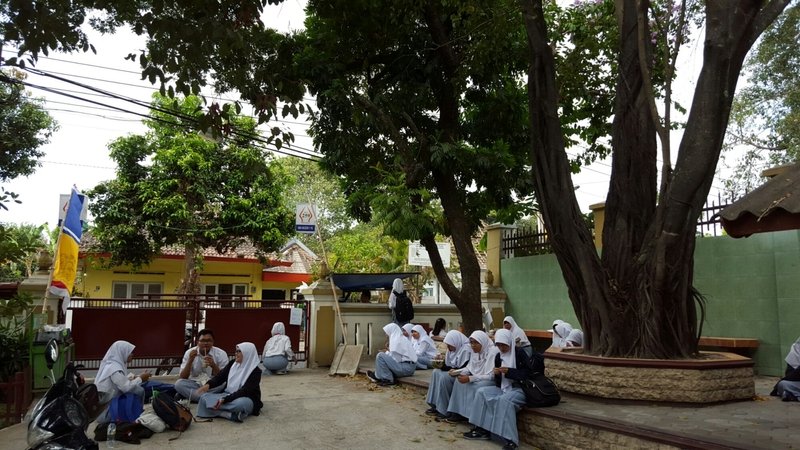 This is the corner of our school yard where students usually eat during break or after school. On the other side of the wall is the mie ayam stand as well as a coconut juice stand, meatball stand, and a mini Indonesian crepe stand. You just holler over the ledge and they hand you a bowl of mie ayam. When you’re done, you slide the empty bowl back under the gate. It’s a great system, and one of my favorite things to do is order a bowl of noodles and sit down and chat with a circle of students. They ask me about America and I ask them about the extracurriculars they’re all so passionate about. 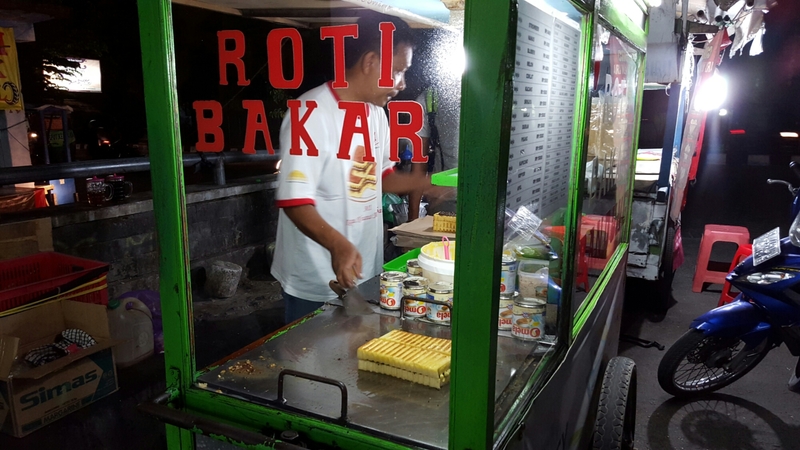 I’ve already talked about lotek, and it’s still my favorite dish in Indonesia. It’s jam packed with veggies like spinach, green beans, cucumbers, tomatoes, and bean sprouts and mixed with tofu, tempe, sticky rice, javanese noodles, and fried gluten – all tossed in a sweet and spicy peanut sauce. 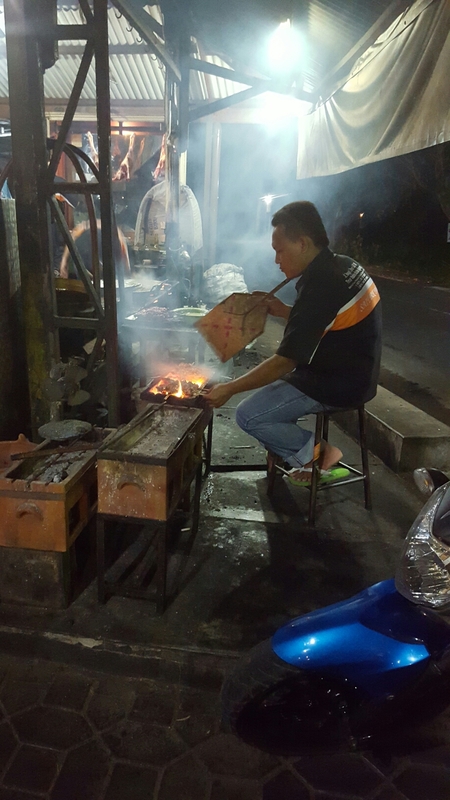 A large reason why I like lotek so much is that it’s always made in front of you, and I get to chat with the lady on her bench as she cuts the vegetables fresh and grinds the peppers, spices, and peanuts with a mortar and pestle to make the sauce. She talks about her siblings, or her children, or the rain, and I talk about how her lotek is the best I’ve ever had. 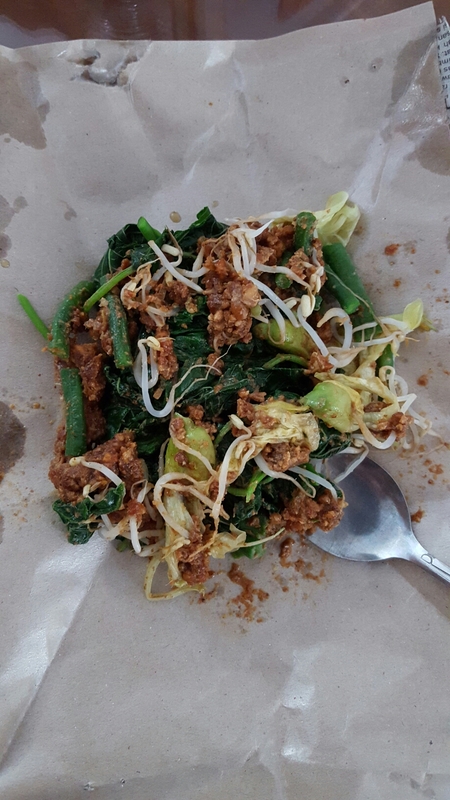 Pecel is basically a derivative of lotek with exclusively vegetables. There’s another cousin dish called gado-gado that has more potatoes than veggies, but the same peanut spicy goodness. 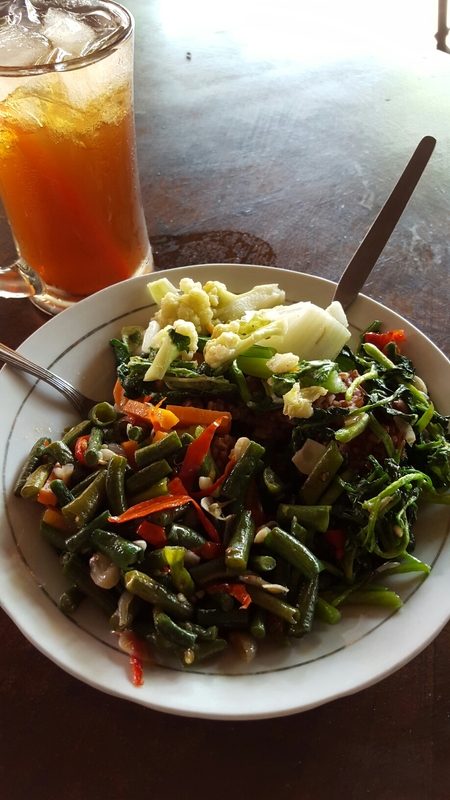 This is just a random assortment of vegetables I like to get at my absolute favorite restaurant in Jogja, Flamboyan. 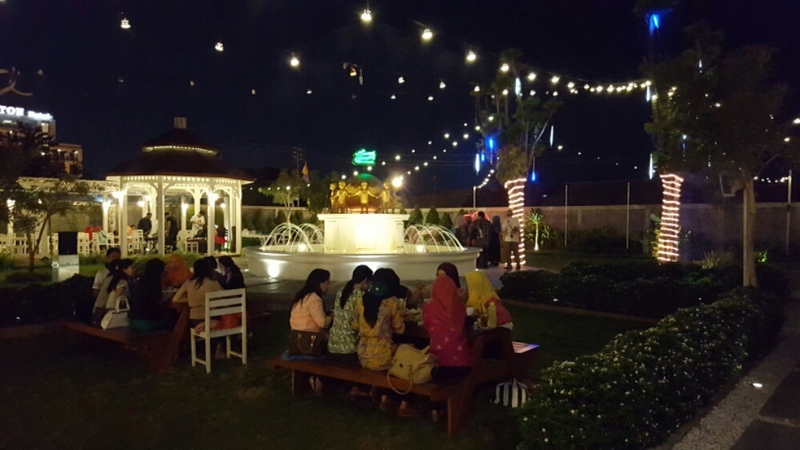 It’s an all-you-can-eat buffet style restaurant with brown rice and the best vegetable dishes. The cashier had to ask me what kind of rice I got because she couldn’t see it under all my vegetables. 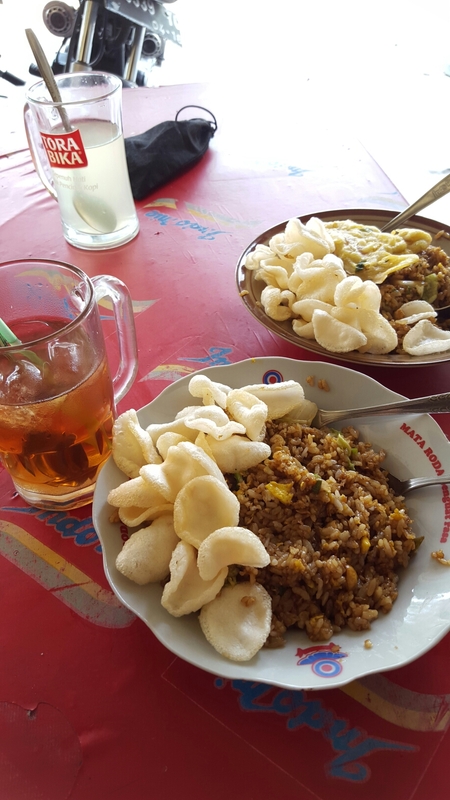 Nasi goreng is simply fried rice, but it’s still somehow significantly better in Indonesia. It’s tangy, spicy, and hits the spot when you’re looking for something quick but substantial. 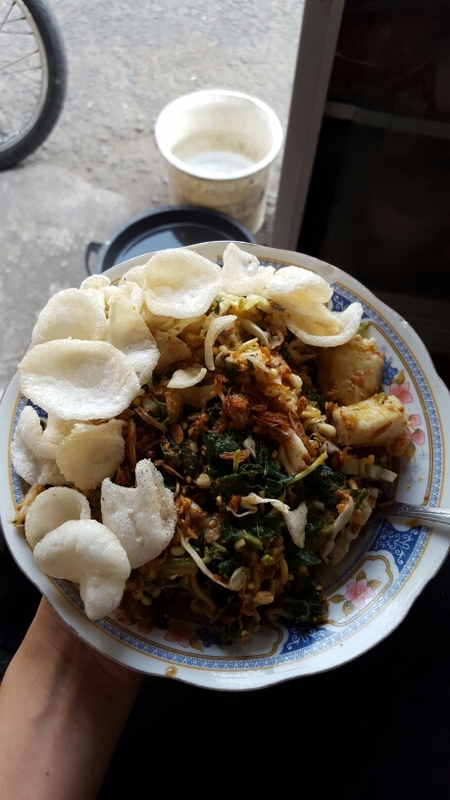 The chips on top are called krupuk, and they’re usually shrimp flavored. 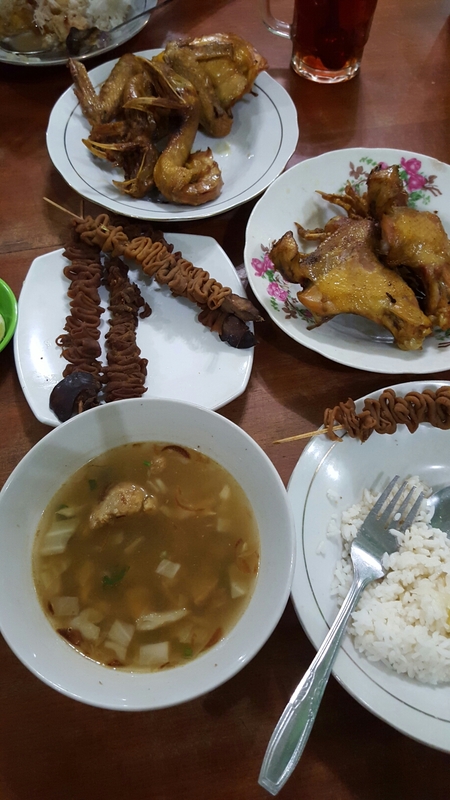 One thing I love about Indonesian warungs is that they leave all these snacks on the table for you to help yourself to, and you just count up the ones you’ve eaten at the end and pay for them altogether with your meal. It’s a great marketing strategy. 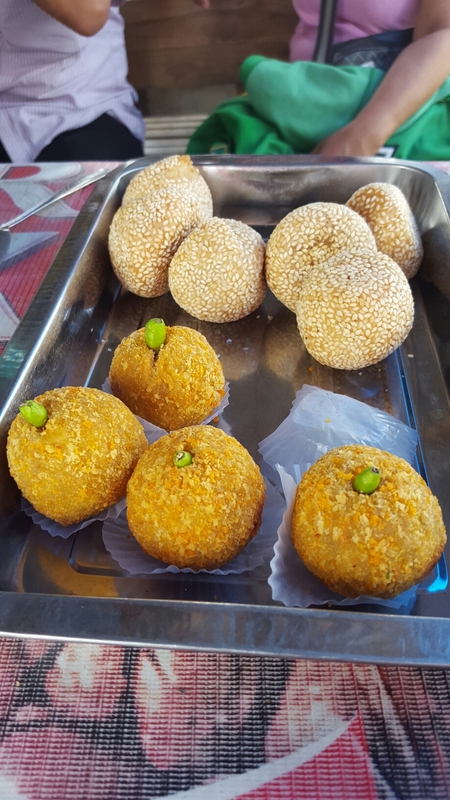 Sesame balls and crunchy potato balls with peppers in them. Bolukukus. 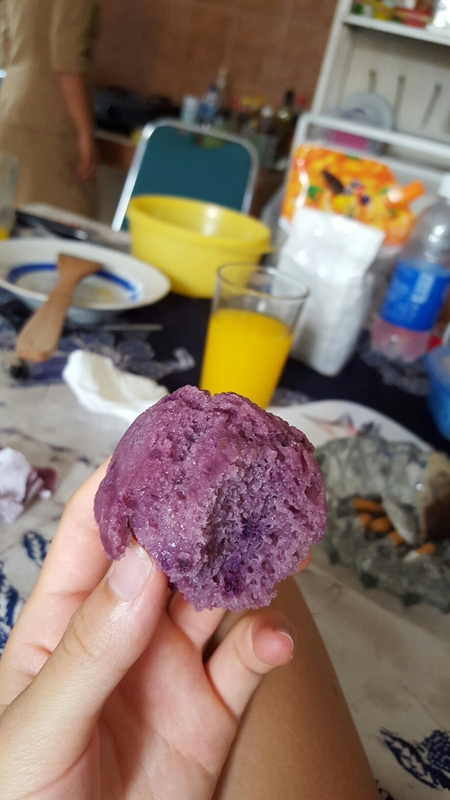 This soft purple muffin is made from sweet potato, and that color is all naturale. 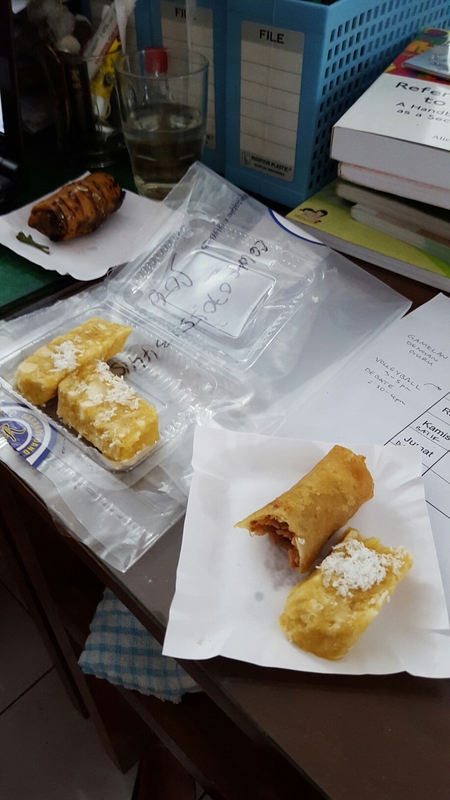 Getuk, mushy/chewy sweet snack made from cassava with coconut shavings on top, and an eggroll with a savory bamboo filling. This is my desk in the teacher room. At school, teachers are always snacking and always sharing (God bless them). A lot of the times when I come back from class there are new snacks on my desk. When the juice lady puts two mangoes in a blender with ice and sometimes milk. It’s bright, it’s fresh, and it’s the greatest reprieve from a hot sweaty day of teaching. 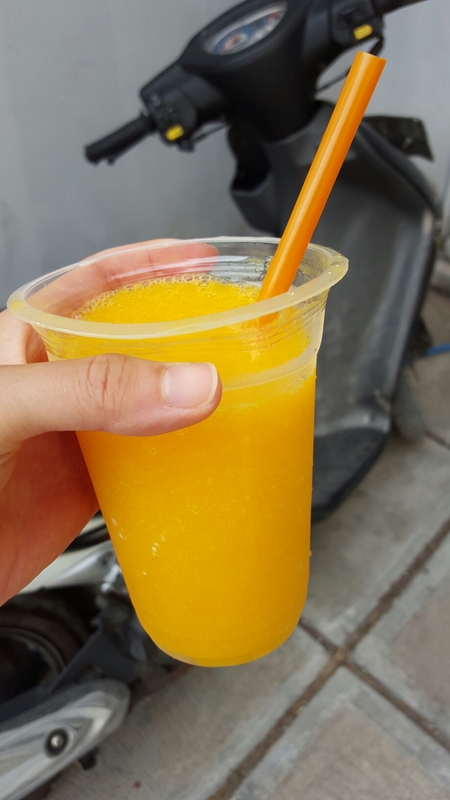 There are juice stands everywhere, and you can get it for about thirty cents. 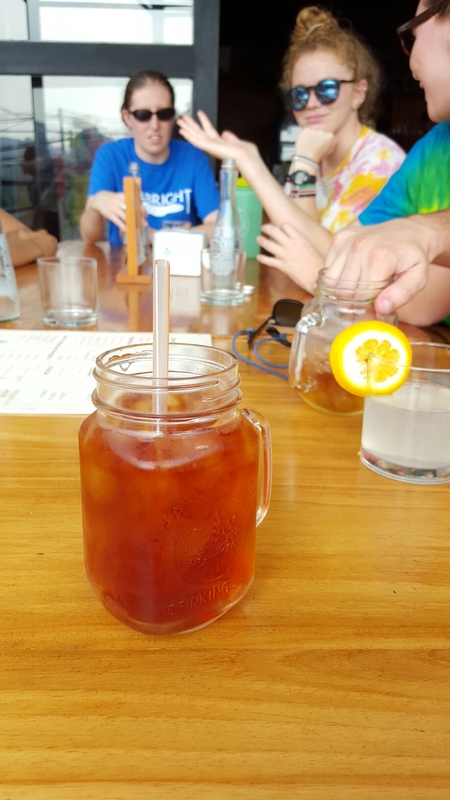 People order iced tea like it’s tap water. 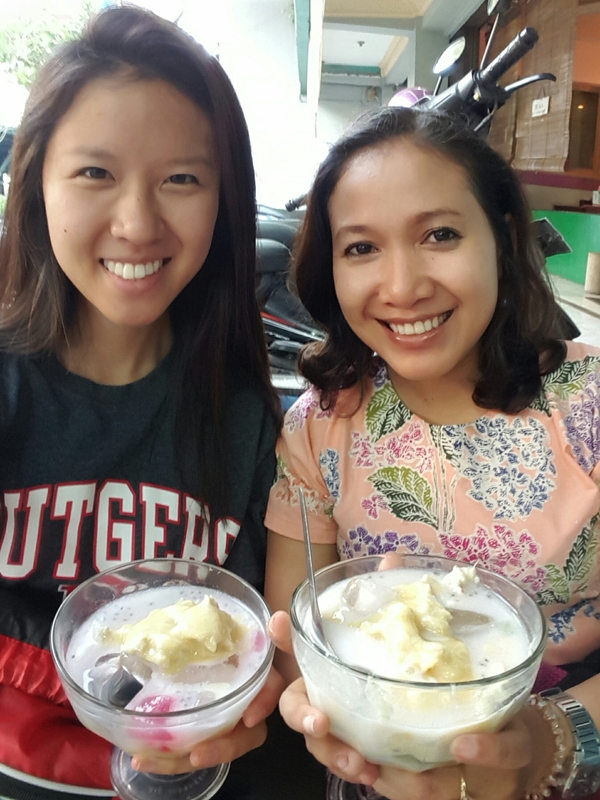 Indonesians like their drinks SWEET, and you can usually see an inch or two of sugar at the bottom. 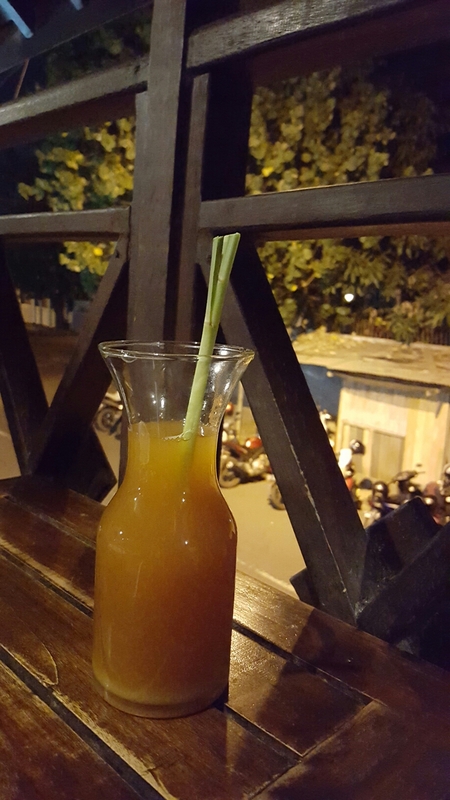 Warm lemongrass and ginger tea at my favorite night time place to sit and unwind with equally tired friends, House of Raminten. The word “joss” means great! Awesome! This coffee got its name from the sound it makes when they drop a burning piece of charcoal into steaming hot coffee (josssssssss). The charcoal acts as a hot cube that absorbs some of the caffeine. 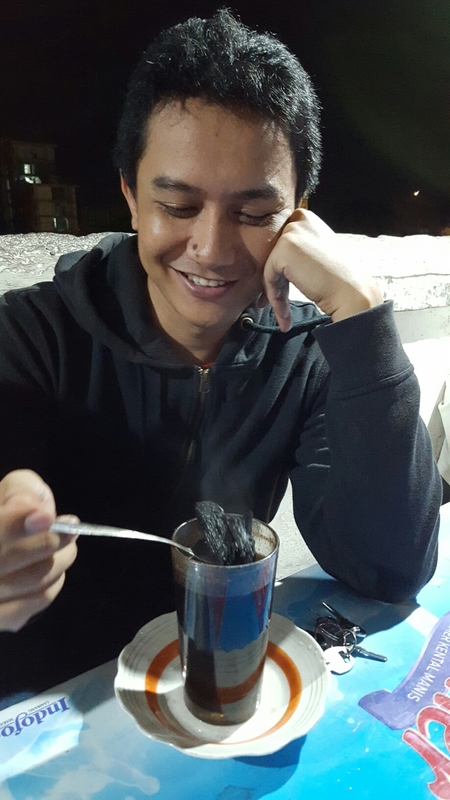 How is it okay to drink a beverage with charcoal in it? I don’t know, but it’s pretty joss. 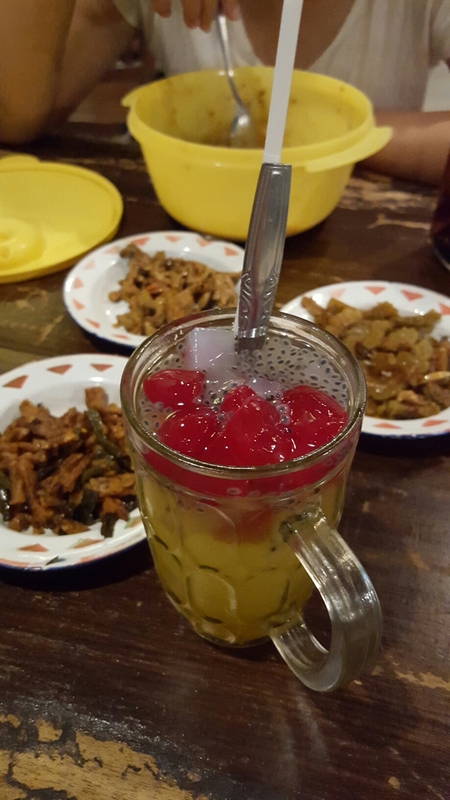 Wedang Jahe – warm ginger drink with lots of sweet goodies in there and fermented rice. 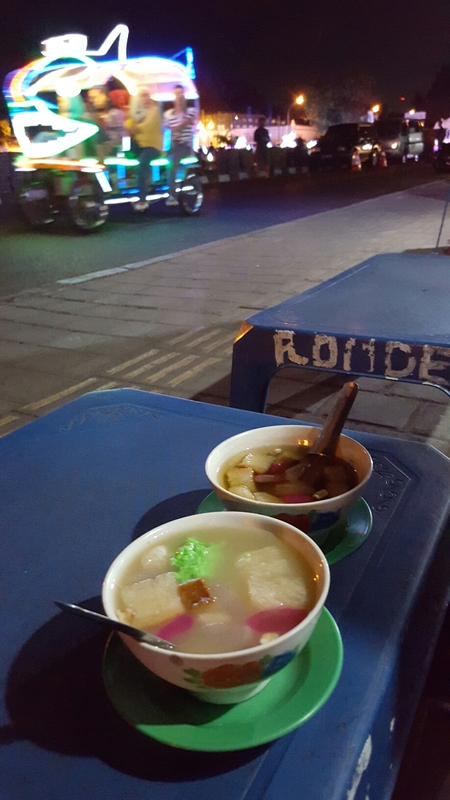 Nothing like sipping warm ginger in the city square while watching fluorescent neon-lit bicycle-mobiles go by at a snail’s pace with electronic music blasting from mini laptops in the front of the vehicles. Literally translated, cat rice, because of the snack-sized portions of rice that are small enough for a cat. There’s usually something salty on top, like anchovies or spicy tempe. 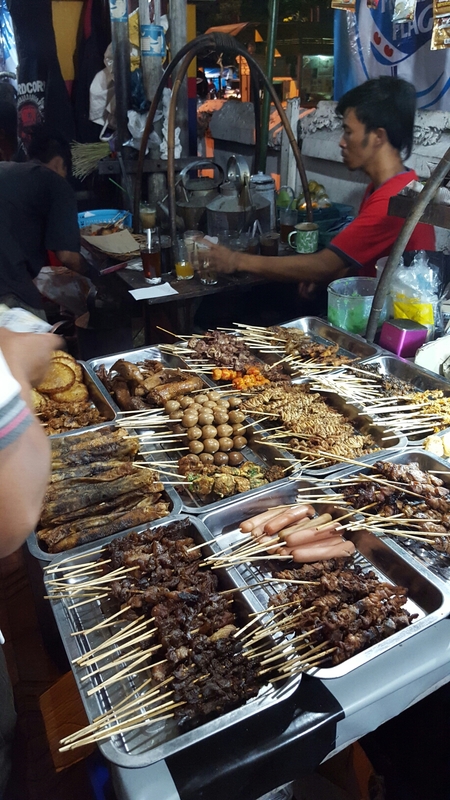 In the other plate – sweet tofu, chicken feet, chicken heart and liver, and quail eggs – your typical street food snacks. After you order you can plop right down in front of the food stand on some straw mats. Chicken shish kabobs that are smothered in spicy crunchy peanut sauce and served over sticky rice. 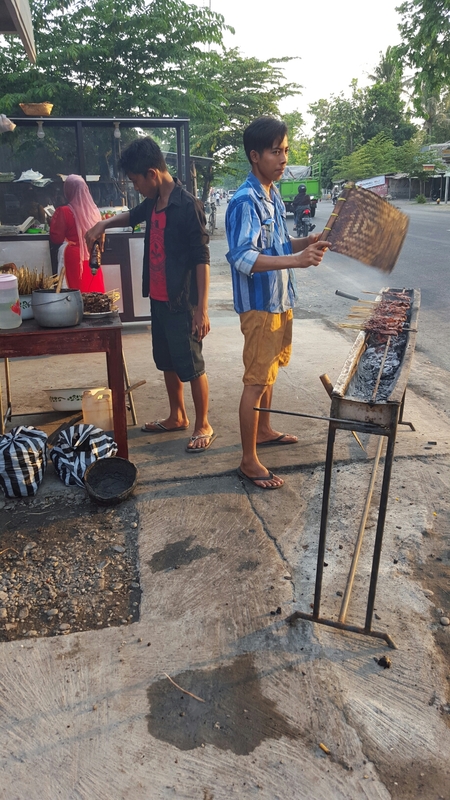 According to my roommate, this particular satay stand is the best in Jogja, and you can find it tucked away on Jalan Bantul. Lamb satay that is juicy and oh so satisfying. This one was from a place called Pak Pong. My mouth starts watering the minute we park and I can see the Pak making the satay right out front. All the smells. The whole chicken and nothing but the chicken. Waste no part of the chicken! Spot the chicken head, body, (very neatly strung) intestinal tract, and liver in the picture above. Why yes, yes I did try every single one of those things, and there is no graceful way to eat a chicken head. 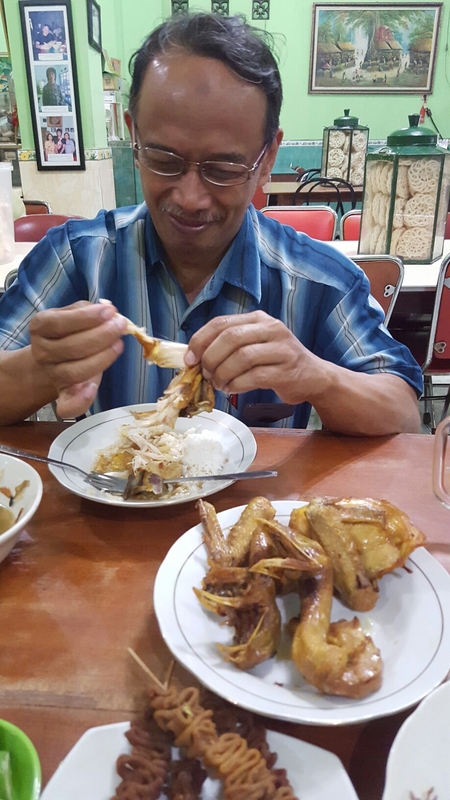 Eating dinner with Pak Asrori, the vice principal of my school. Good thing I wasn’t struggling to eat new shapes and sizes in front of anyone important or anything. 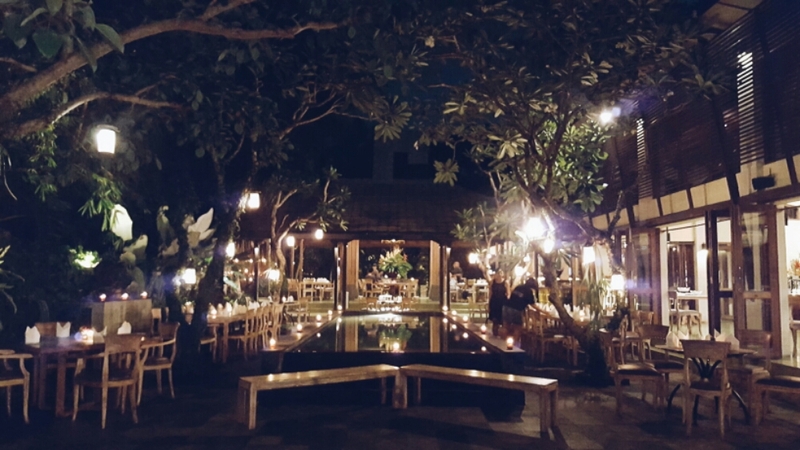 If I have you grossed out in the slightest, let me remind you that Indonesia is a beautiful tropical island, and because of this almost every restaurant makes me feel like I’m eating in a secret garden. 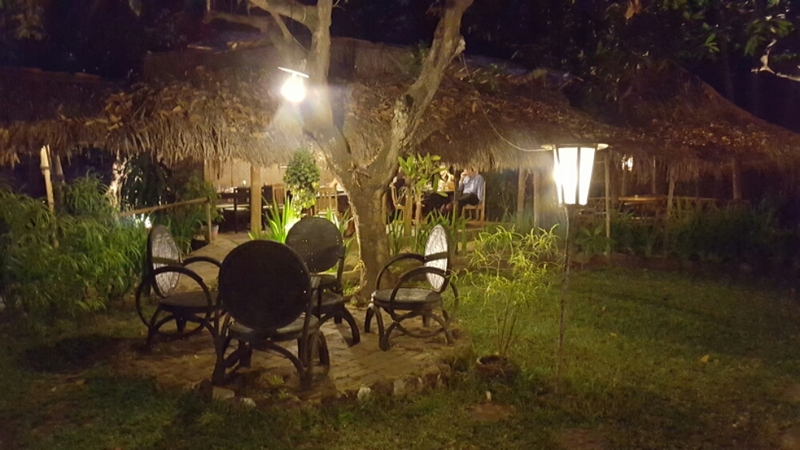 The palm trees, fruit trees, the straw mats and roofs, glowing lights strung here and there, and just the overall openness to the outdoors that is enabled by being on the equator and having summer weather all year round. 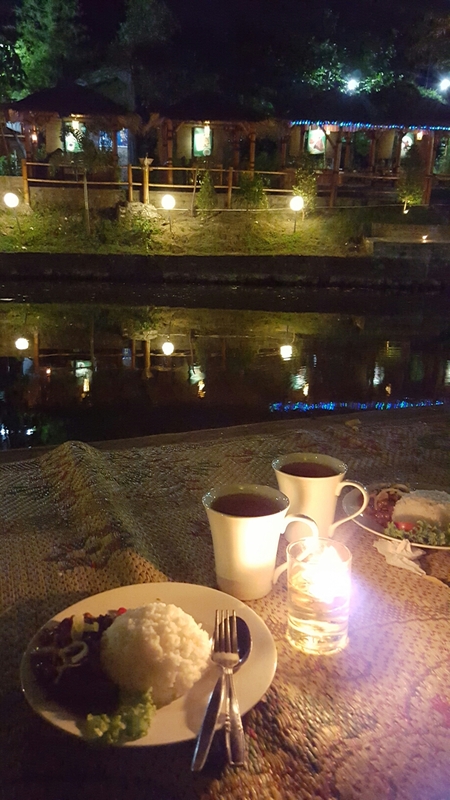 I am never closed in by walls in Indonesia, and I love being this in tune with the outdoors. 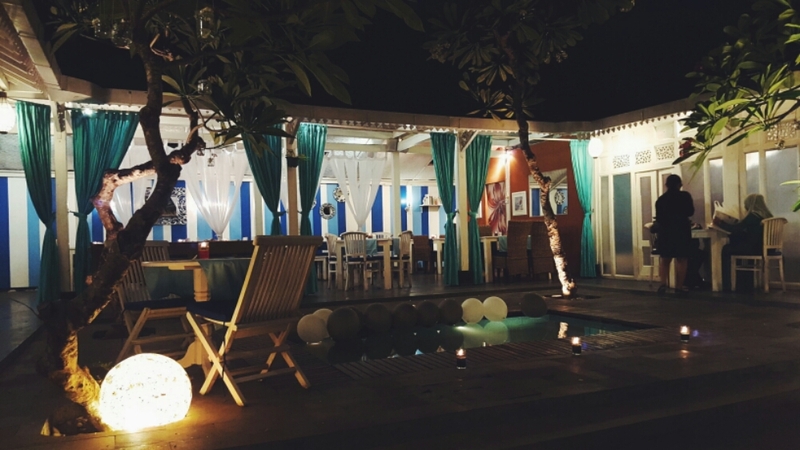 Here are some really lovely atmospheres in Jogja. 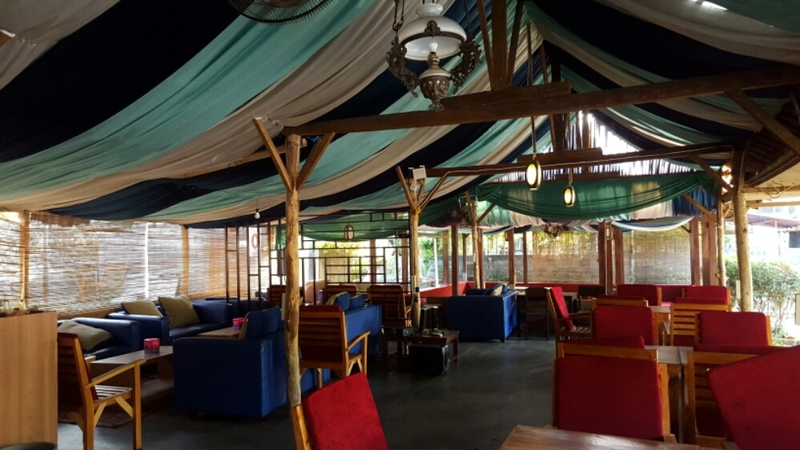 Milas, a very very organic vegetarian restaurant with great food and their own books and crafts store as well. 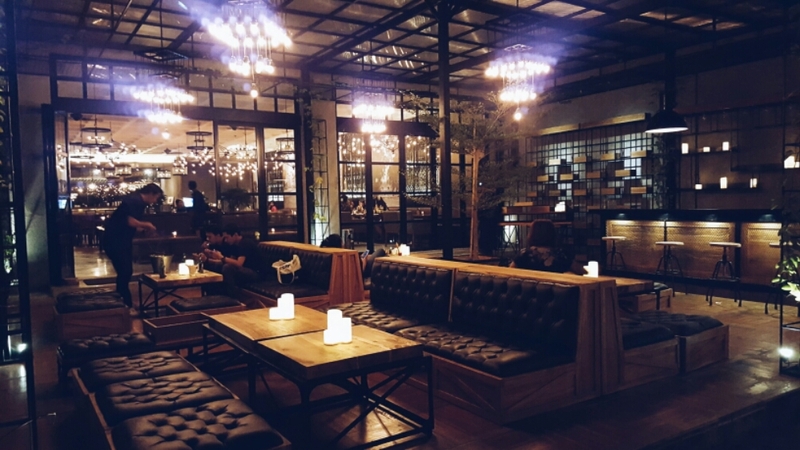 Chanting, a rooftop restaurant and bar on top of Galeria Mall. 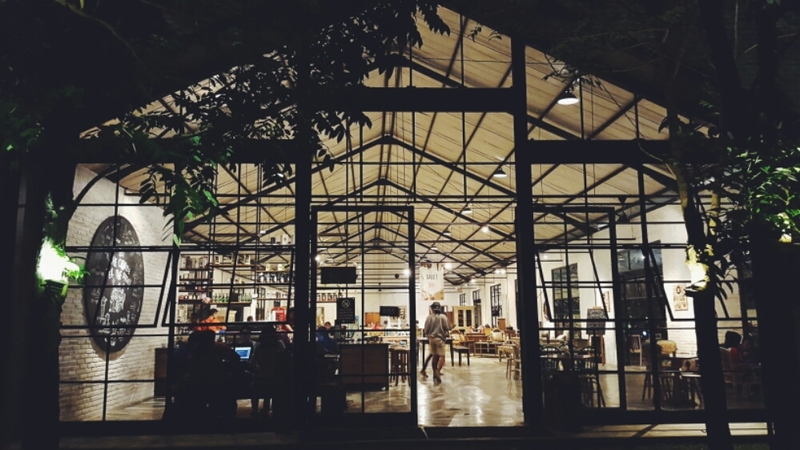 Epic coffee, a cafe and a furniture store combine to make this illuminating warehouse. This is my favorite thing to get late at night. They have these stands everywhere, and it’s basically just extremely buttered up toast with cheese, chocolate, or peanuts inside. It’s salty when it touches your tongue, crispy when you bite down, and sweet when you take it all in and roll your eyes in gustatory happiness. 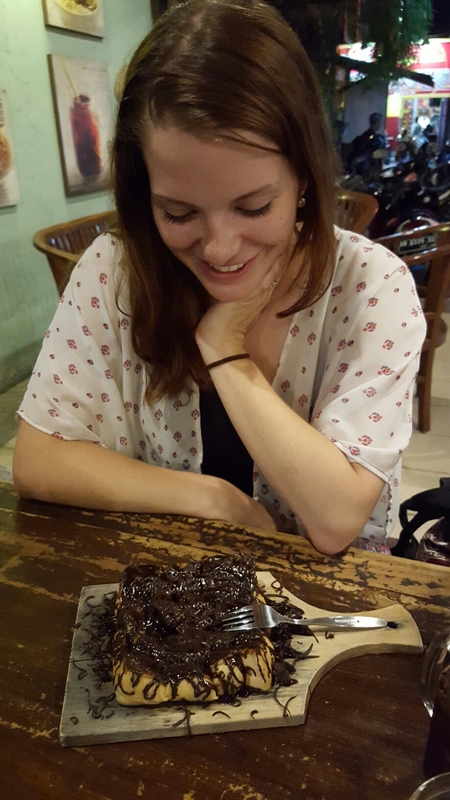 My sitemate, Kendra, with a mess of chocolate on top of her roti bakar. This dessert place puts a dollop of the notoriously smelly fruit in condensed milk with ice and other sweet jellies. It’s pretty good if you can get over the smell. 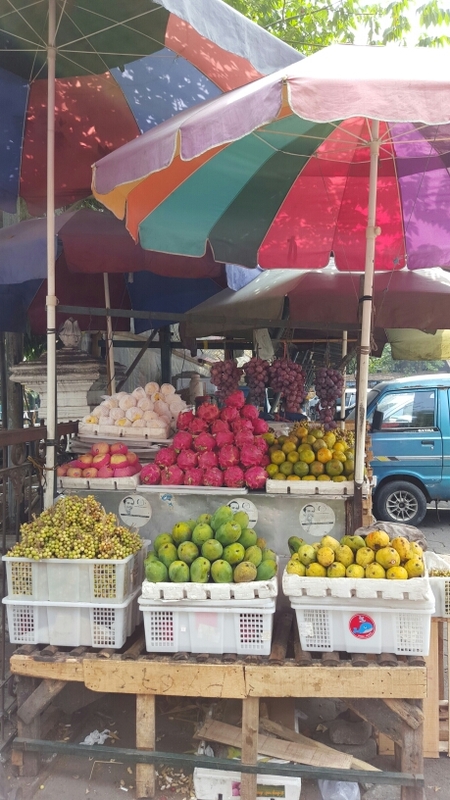 Living in a tropical island means fruit grows naturally everywhere, and I have tried so many new and interesting fruits upon coming here. 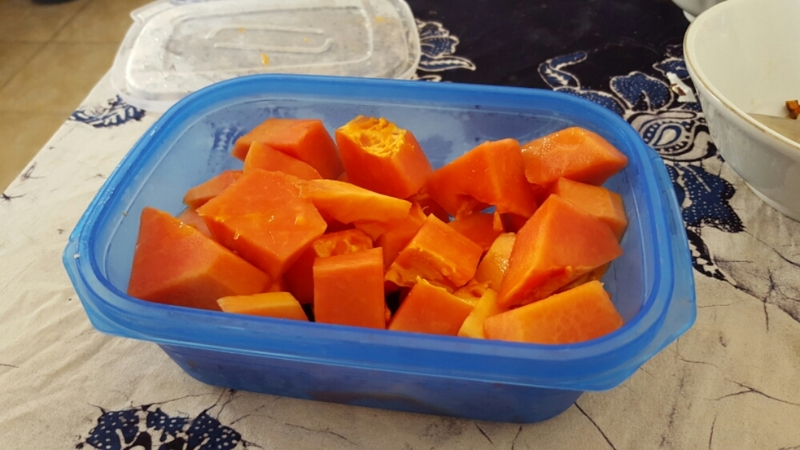 My absolute favorite fruit is papaya – and it just so happens to be the cheapest and most prevalent fruit in Indonesia. Rambut = hair. Ramutan = hairy fruit. 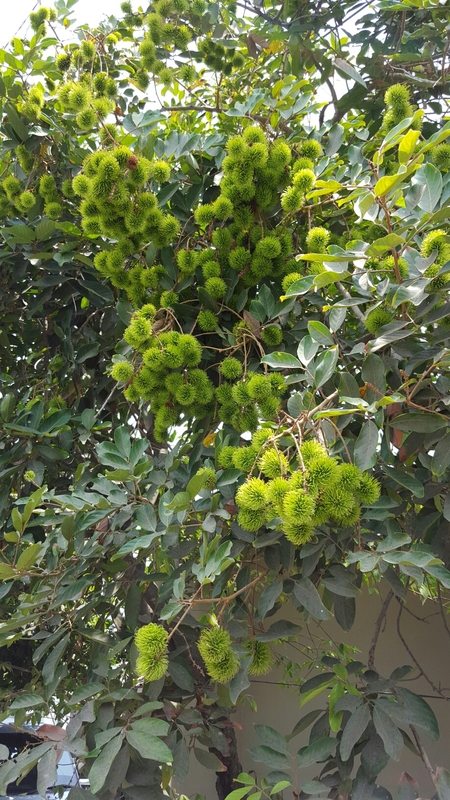 This fuzzy fruit grows right in my neighborhood and while the ones in this picture aren’t ripe yet, they’re just as hairy. 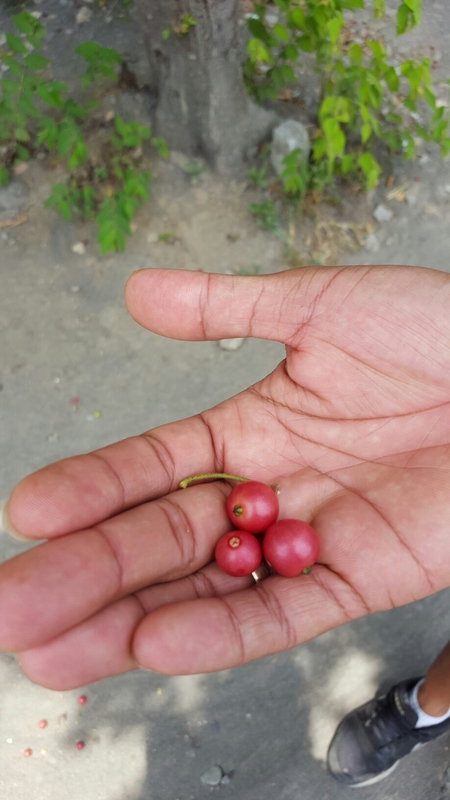 I don’t know what these berries are called in English yet, but they also grow in my neighborhood and I love picking a couple on my way back and washing them when I get home. Each of them is a burst of sweetness, and I feel like they should be froyo toppings. This fruit tastes like a mix of guava and pineapple, and the flesh tears off in strips. It’s super fun to eat. 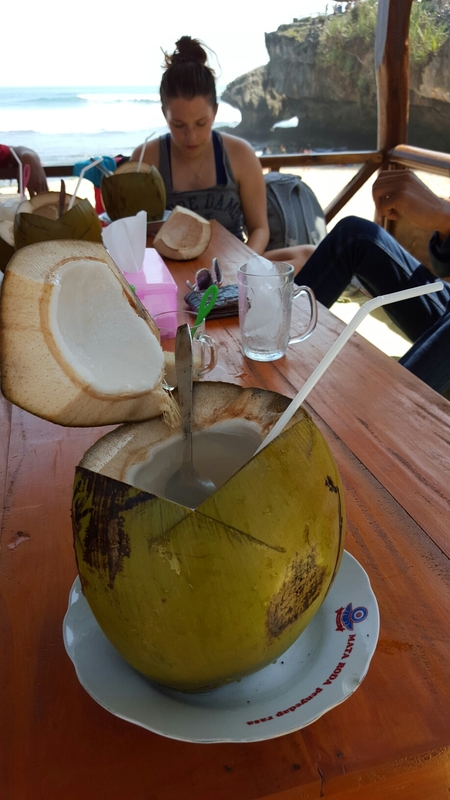 There are coconut trees everywhere, and at the beach you can upgrade your meal by getting a whole coconut for under a dollar. 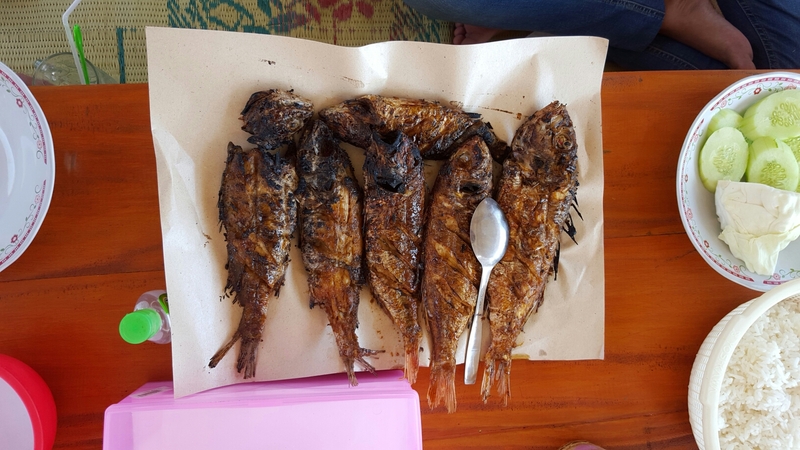 At the beach you can also order freshly caught fish that they barbecue for you and serve with a bowl of sambal. Sambal is spicy sauce made from chilli peppers and you can find it as often as you find salt and pepper in America. Meet my roommates! 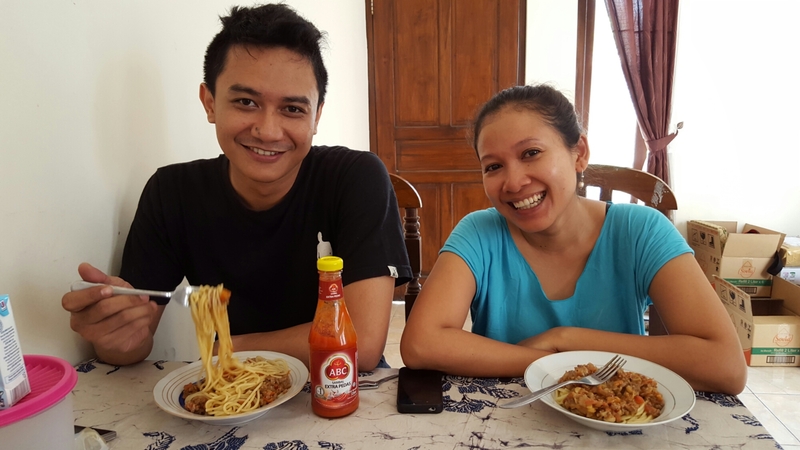 From morning weekend lunches to late night instant noodles, it’s always fun cooking at home, and Isti (right) is a pro in the kitchen. Isti made this dish one Sunday morning, and I was hooked. 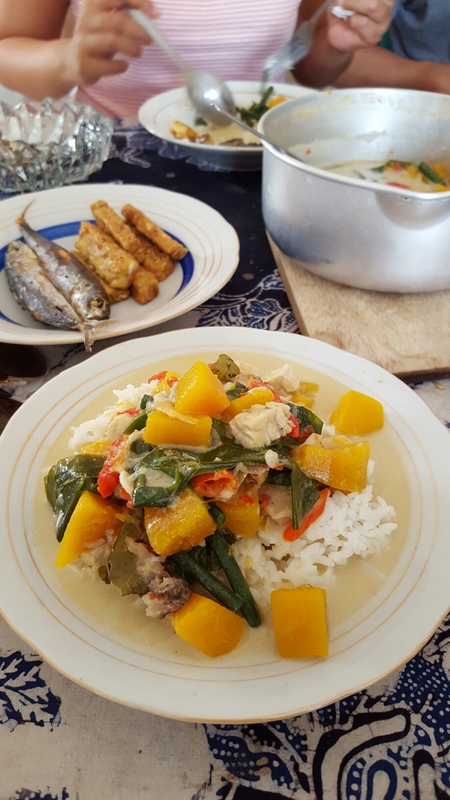 It’s pumpkin, green beans, and all sorts of herbs that were completely new to me, like galanga, salam, and melinjo, all stewed in spicy coconut milk. 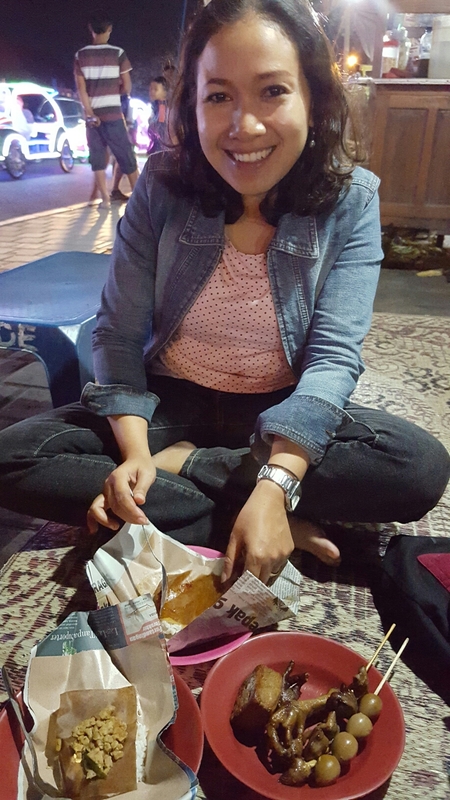 When Indonesians talk about food they use the word enak, meaning delicious, so when food is good it’s delicious – there’s no in between, and every meal I’ve had thus far has proven this to be completely and utterly true. 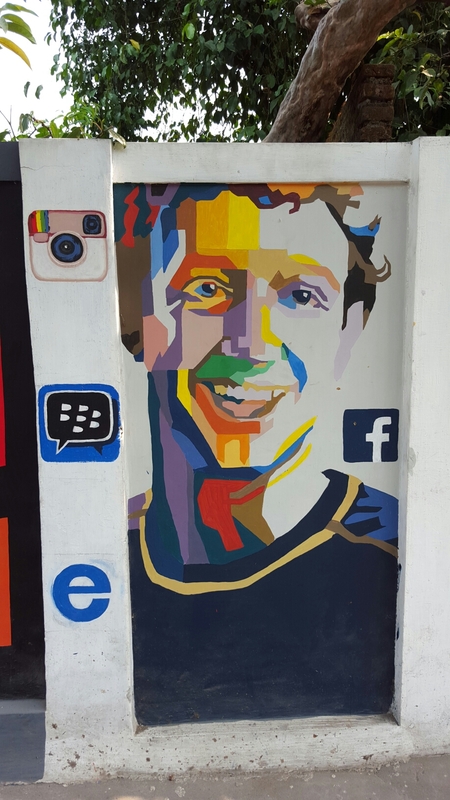 The students at my school are in the heat of their mid semester exams, and as a result of some rule that doesn’t allow me to be present during exams, I had the week off to get to know this city more – and there’s a lot to know. 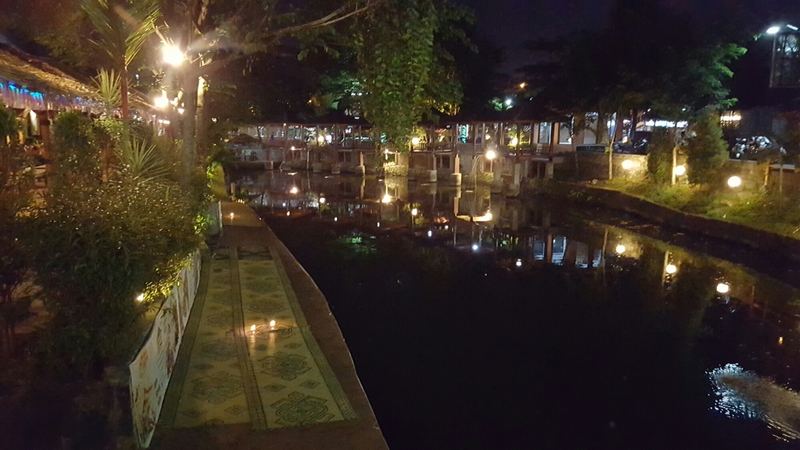 Something I’ve been meaning to see in Jogja that is actually just a short bike ride from my neighborhood is the Sultan’s Water Castle, Taman Sari. So, I hopped on my bike at noon on Thursday, and after stopping only once to ask for directions, I rolled in through the gates of the Water Castle. When the man who collected my ticket struck up a conversation and walked in with me, I thought he was being friendly like Indonesians always are, but the conversation turned into a complete personal tour of the water castle grounds. 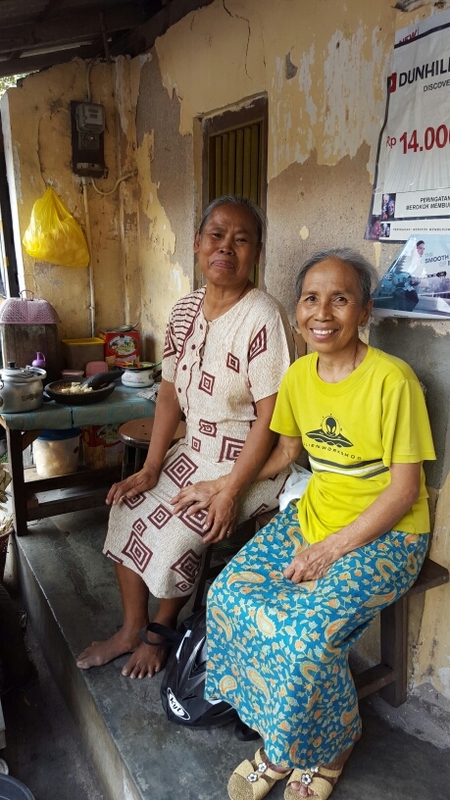 The pleasantness of being taken around on a private tour was complemented by the added challenge of the entire tour being in Bahasa Indonesia, and here’s what I managed to take away from it. 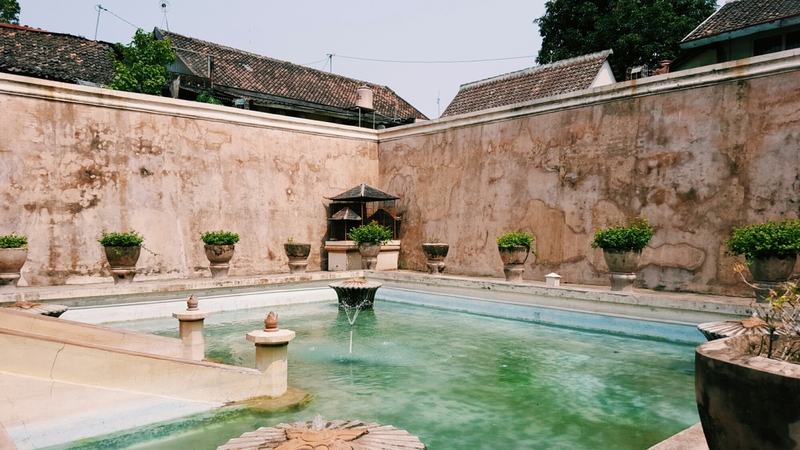 Taman Sari was a luxury bath house used by the Sultan of Yogyakarta and his many wives, children, and guests. 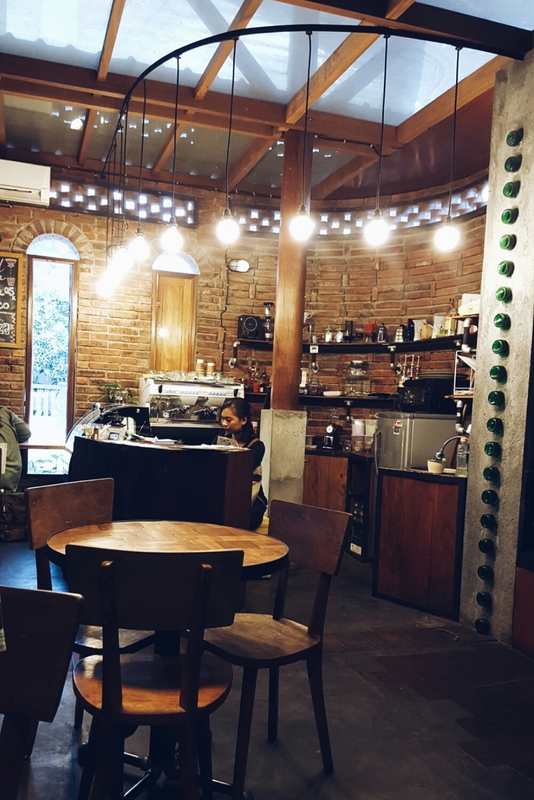 It is now a cherished relic of the past, and is actively maintained and renovated, especially after taking a hit from the 2006 earthquake that shook Jogja and ruined places like Bantul, a village just outside of Jogja. 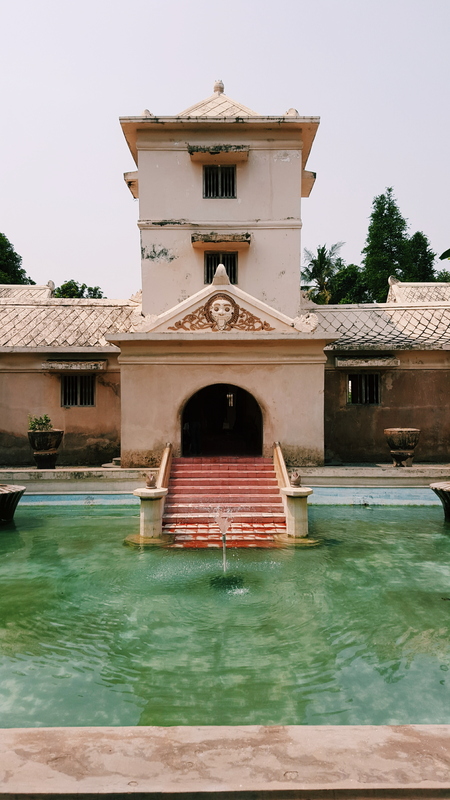 The castle itself has a blend of Chinese, Indian, and European architecture, and is set up with multiple houses that hosted orchestras of gamelan that the Sultan could observe from above. 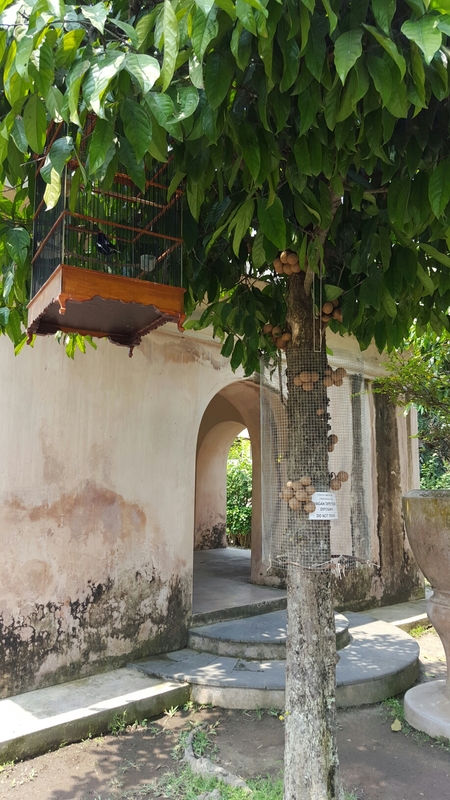 The baths are surrounded by sweet smelling jasmine bushes and exotic bird cages. 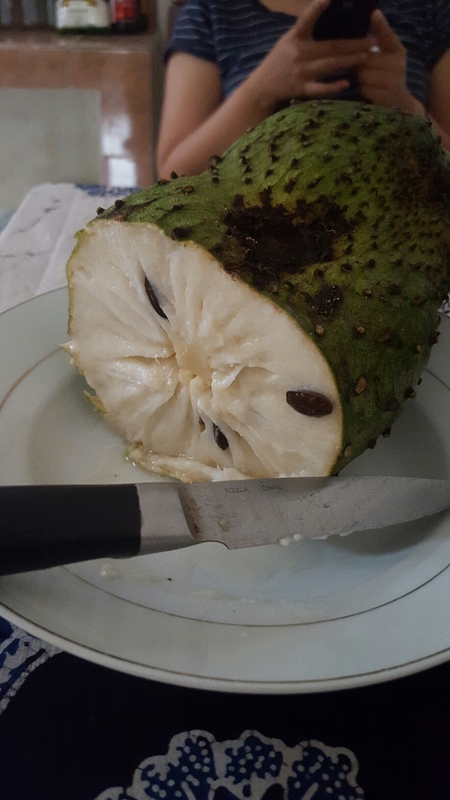 Kepel, a fruit only found in places like Taman Sari or the Kraton (Sultan property). 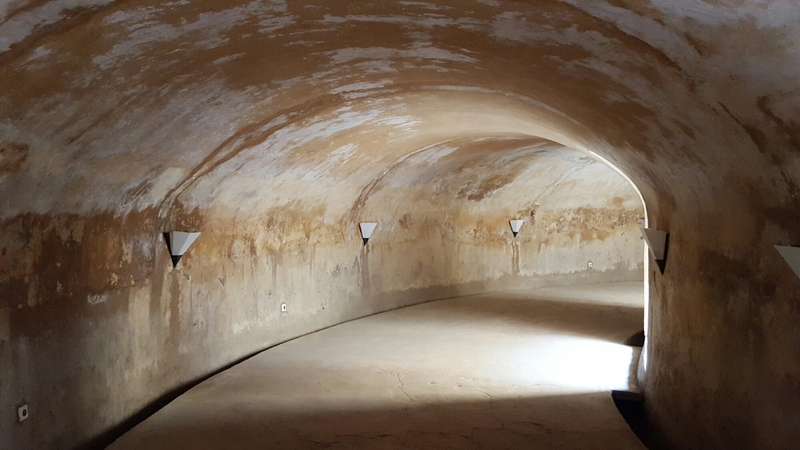 Underneath the bathhouse is a series of underground tunnels that leads to a subsequent underground mosque. 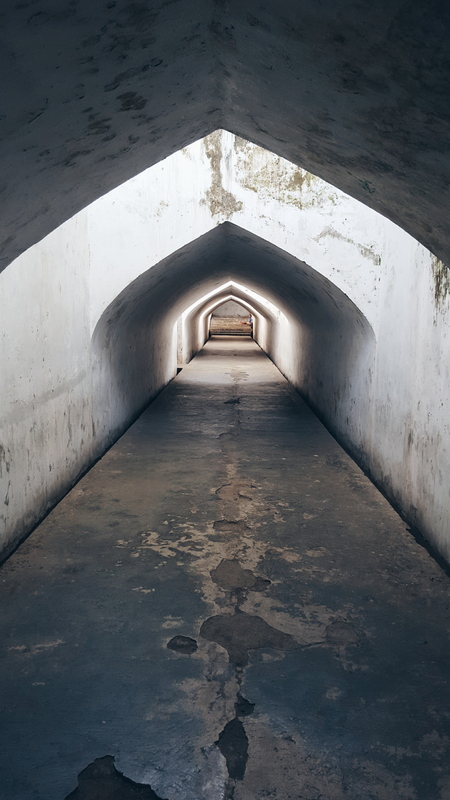 Sometimes these tunnels were used as a means of escape during war, but most frequently they were used to get to daily prayer. 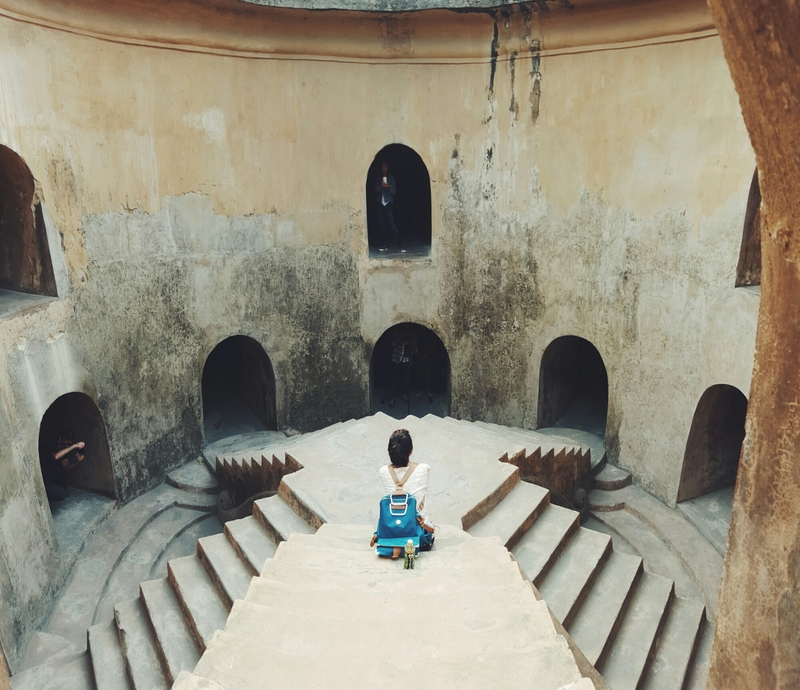 The mosque at the end of the tunnel was circular in structure, providing excellent acoustics for prayers to travel. 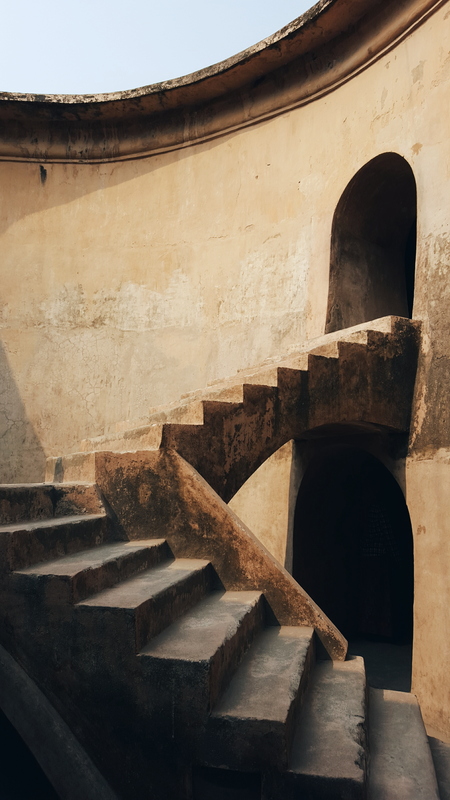 At the center of the mosque is a convergence of five staircases symbolizing the five salats (prayers) performed each day. 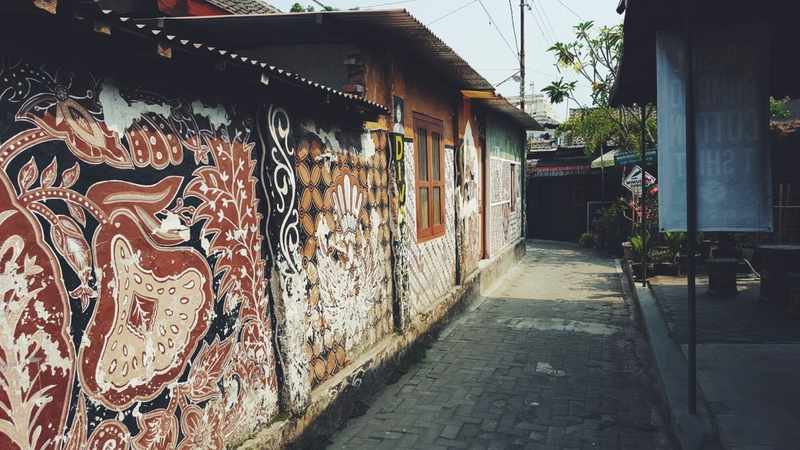 Around Taman Sari, there is a tight-knit community rich in timeless Indonesian traditions. 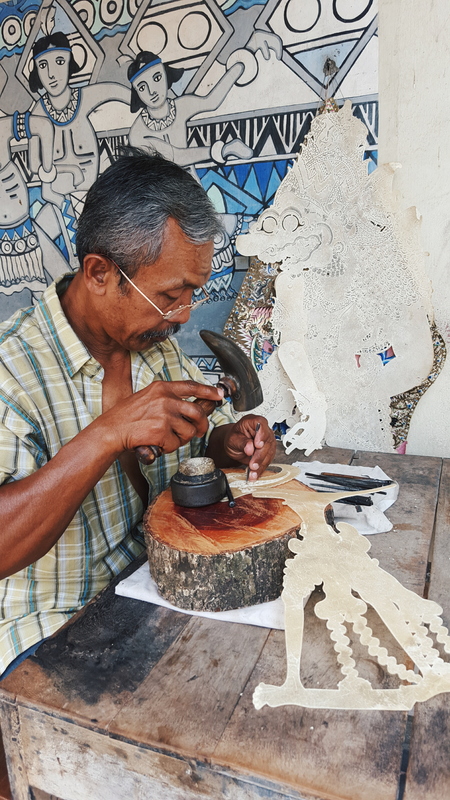 This Pak was using tools from a buffalo horn to carefully chisel in the intricacies of a Wayang Kulit puppet onto thick cow skin (kulit=skin). 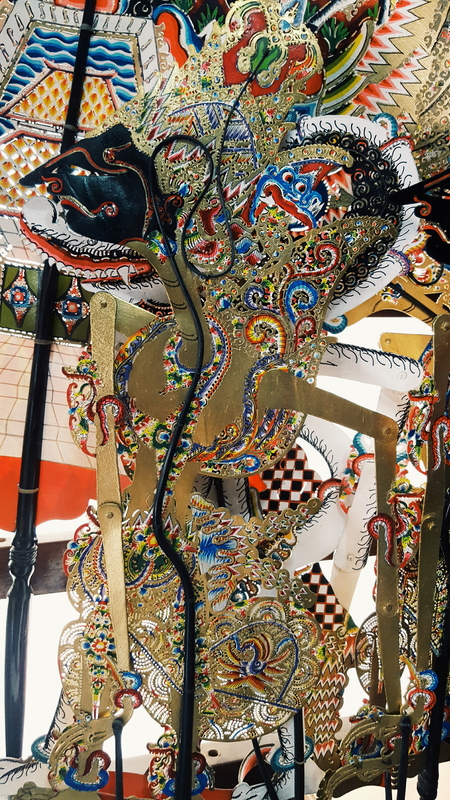 Wayang Kulit is the famous traditional Indonesian shadow puppetry that usually depicts the stories of Hindu Ramayana. A finished product. One puppet takes about a month to complete. 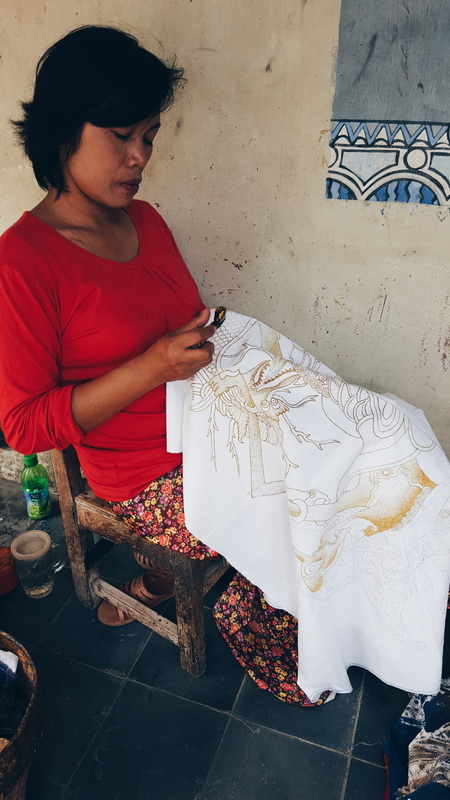 This Ibu was dripping hot wax one drop at a time onto the fabric in a process of color dyeing to make batik. The wax covered areas on the fabric remain untouched by the dye once it emerges and can be removed to reveal beautiful motifs, patterns, or in this case, drawings. 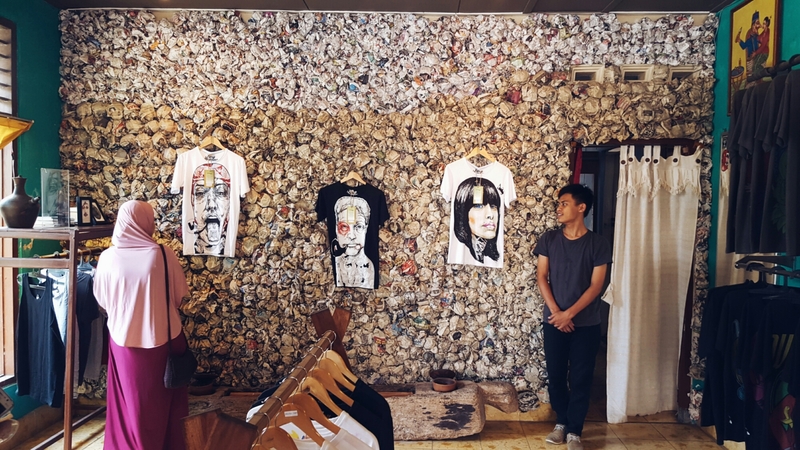 Outside the castle is an effortlessly hipster art community. 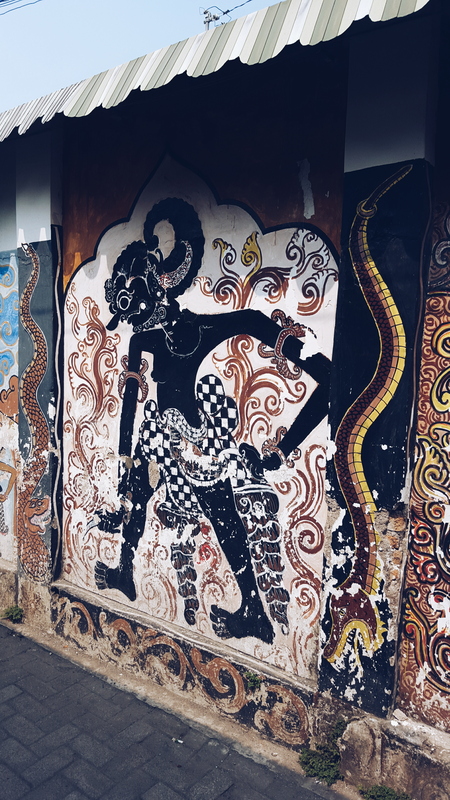 House graffiti of Ramayana characters and traditional Jogja batik motifs. 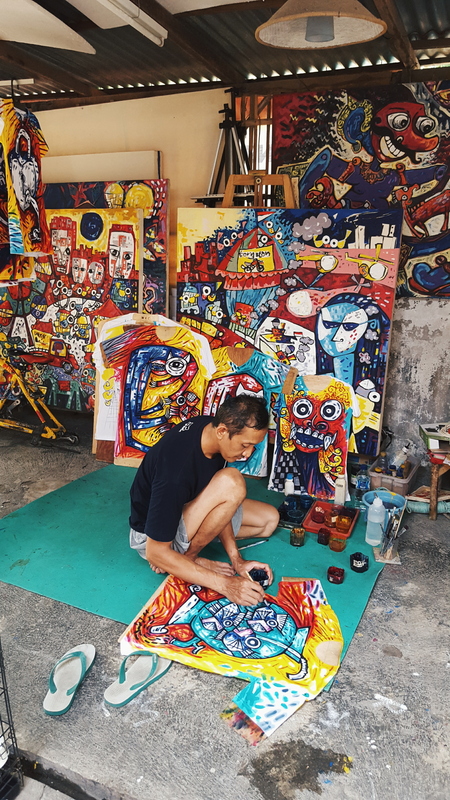 Indonesians express themselves in so many ways, from painting to singing to beautiful age old cultural traditions, and they do it so well. 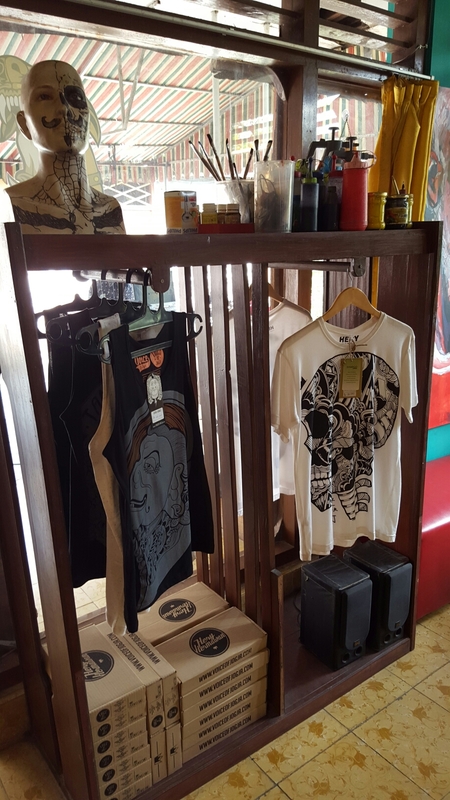 This little store was selling t-shirts made from bamboo cotton, the softest cotton I have ever felt. 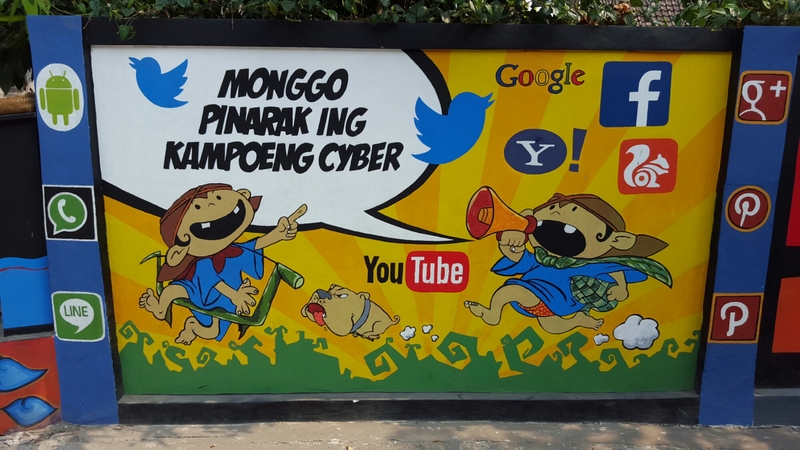 To my pleasant surprise, there is a small community here called Kampoeng Cyber that promotes the spread of Internet use as a means of empowering the local community through the availability of greater communication. 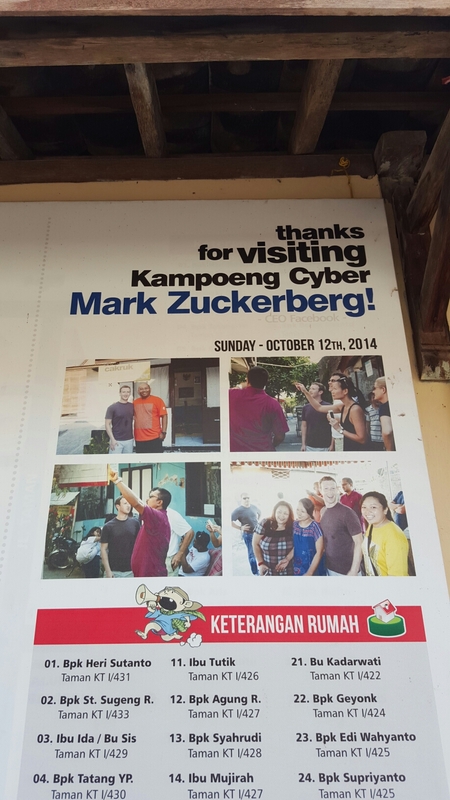 I was happy to see that Mark Zuckerberg had paid this little village a visit last year, but I think the Indonesians were happier. Last but not least, Pak Nanto! 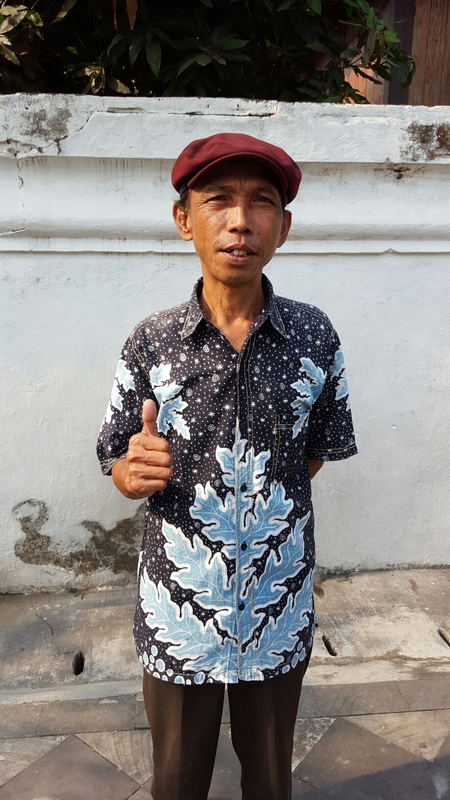 My tour guide and new friend, who patiently explained to me the magic of Taman Sari, who led me deep into tunnels underground, who entertained all the questions I was able to piece together in Bahasa, and who shared with me the cultural traditions that are still very much alive in and around Taman Sari.